Hearing damage can be caused by listening for long periods at quite moderate levels, or for quite short periods at high volume. In short, it is the combination of listening period (time), how loud you listen (volume) and the type of sound you listen to (density) that creates the “dose” of sound that does the damage. Preventing Noise Induced Hearing Loss (NIHL) is largely an exercise in self-discipline. There are tools you can use to mitigate the risks, but you must also help yourself. Be aware of the sound around you. If you have to raise your voice to speak to someone 6ft away from you then you are in ambient noise above 85dB. Spending much time in this level of ambient noise will cause hearing damage. If you work in a noisy environment, your employer is obliged to conduct a noise survey and, if necessary, is required to provide you with the correct protective equipment (which you are equally required to use) and training in how to avoid risk. If you are in a noisy club or gig, wear earplugs, don’t stick your head in the speaker bins, and give your ears a rest from time to time. The earplugs don’t have to be of the foam or wax types you can buy on the high street. These will work, but they will make the music sound like you have your head under a pillow – muffled and indistinct. This is because they filter out most of the high frequencies, which is where the detail is in the sound spectrum. They’ll also make speech hard to understand – in fact, they will sound quite like the NIHL we are trying to avoid! There are various earplugs marketed for musicians which have a diaphragm in them which attenuates all frequencies equally. 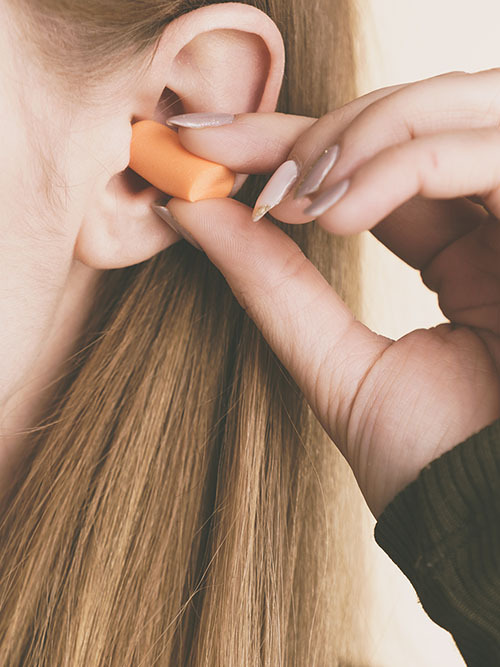 They are rather like sunglasses for your ears, and just as sunglasses will help you to see on a bright day, attenuating earplugs will help you to hear clearly in a noisy environment. When you first put them in, things will sound different, but if you persevere, you’ll realise that the reason they sound different is that you can hear things clearly, without the harsh sound and discomfort you had before. If you are wearing headphones, keep the level down as low as you can, or use HDM®Pro or LimitEar-FLTM to control the level automatically. If you listen on a Smartphone, consider downloading the HearAngel® app to help you to look after your hearing. If you’d like to know more about hearing loss prevention and how you can protect yourself or others, please do get in touch with our team of experts.